Located on Pennsylvania Avenue om Washington DC, the Newseum is dedicated to sharing the history of journalism and news coverage from the 16th century to the modern era. The façade of the museum features a 74-foot tall marble panel inscribed with the First Amendment. There are 15 theaters, 14 major exhibit halls and two state-of-the art broadcast studios. The museum is designed for guests to start on the top floor and work their way down. Exhibits chronicle the history of photojournalism and electronic news. 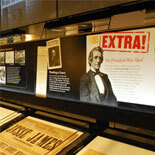 The museum explains how the press has reported major events. You can watch news coverage from over 190 countries and compare the level of press freedom. The museum conveys the dangers that reporters experience covering the news. You will also learn how radio, TV and the Internet have changed the way that news is covered and disseminated. There is an exhibit hall dedicated to the First Amendment and one that honors journalists who have died while covering a story. The Front Page display is a compilation of the front page from more than 80 newspapers from around the world. One exhibit hall displays the largest collection of Pulitzer Prize winning photographs. The museum plans to use its television studios for news and public affairs programs. The theaters screen documentaries and films as well as host debates, town hall meetings and artistic performances. A time-travel adventure provides a 4-D experience by combining a 3-D film with additional effects.